I learned how to cook delectable Akha-style Thai food. Never heard of Akha? Well, they're one of the many hill tribes living in Northern Thailand. They have their own language, and a distinct culture and social system. All their villages are entered via an elaborately carved 'Spirit Gate', and their houses are segregated by gender. If you've been to Chiang Mai, you'll probably recognize their black jackets embroidered with colourful patterns and distinctive head-dresses. Akha Thais have really great food. Last Saturday, Abbie, Darko and I donned our aprons and created eleven delicious dishes at the Thai Akha Kitchen Cooking School, in the heart of Chiang Mai Old City. With the assistance of our friendly and knowledgeable teacher, Niti, we made a mountain of amazing food, including Hill-tribe salad, curries, stir fries, soup, homemade spring rolls and desserts - yum! 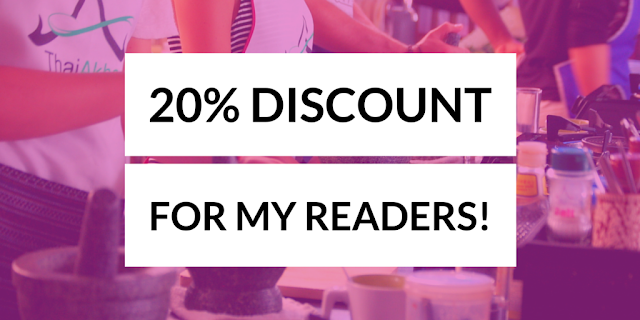 Psst - I've got My Chiang Mai Everything readers a sweet 20% discount off all classes at Thai Akha Kitchen. Details are at the bottom of this post! If you know me, you'll know I'm really not a morning person. I truly appreciated the hot filter coffee on tap at 8:15 a.m. As my (vegetarian) friend Abbie and I were consuming our caffeine, we were greeted warmly by Niti. Soon, our friend Darko also arrived, and we set off for a local market, picking up more cooking-class-students on the way. Local Thai markets are chaotic spaces filled with people, colour, smiles, food and noise. Our group wandered around the market, lead by Niti. She pointed out things of interest - did you know that every single part of the banana tree can be consumed!? - and purchased several delicacies for us to try, such as crunchy pig tails, Thai olives and various sweet snacks. When we got back to the classroom, we sat at our clean, individual cooking stations and listened to Niti explain Akha life. 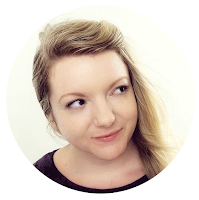 She's an interesting lady and a captivating speaker with genuine warmth and a cheeky attitude. After learning about the Akha tribe, we tied our aprons and began to cook. At Thai Akha Kitchen, students can choose what they want to cook from an extensive set menu. We all pitched in to help Niti make papaya salad (som tam), sticky rice, fried spring rolls, Akha soup, Akha salad, Akha tomato dipping sauce, mango sticky rice and pumpkin in coconut milk. Chicken with cashew nuts (gai ped med mamuang), chicken with basil (pad kapow), sweet and sour chicken or pad Thai. Hot and sour prawn soup (tom yung koong), chicken in coconut milk (tom kha gai), or clear soup with tofu. We made SO MUCH food. Niti showed us how to make curry paste from scratch, using a heavy stone pestle and mortar. Apparently, if a Thai girl can make curry paste without clinking the mortar on the pestle, she will make a good wife. If she's a clinker, though, watch out! She'll be a lazy wife for sure. Nowadays, Niti revealed with a wink, most people use a blender. We rolled up our own spring rolls, and took them to be deep-fried by Niti. Crispy and delicious, fresh from the pan. Niti made (almost) everyone laugh by speaking with relish about 'fuk' - the Thai word for squash! Mr. Green T-Shirt wasn't so impressed though. The word for pumpkin is fuktong, and Niti really enjoyed telling us this fact with a big cheeky smile. Niti revealed the secret ingredients Thai chefs use to work magic in a Thai kitchen. I loved the actual cooking, but the best part for most people was eating delicious home-cooked Akha-style Thai food. After we'd finished cooking and eating, Niti gave each of us a booklet full of recipes we'd made that day. Wahoo! Thai Akha Kitchen want to give a 20% discount on all day or evening classes to My Chiang Mai Everything readers. Simply message Thai Akha Kitchen using this contact page, and mention that you're a My Chiang Mai everything reader. Then, they'll book your places for you and apply the 20% discount - easy. I recommend the outstanding Thai Akha Kitchen to people wanting to make a variety of Thai dishes. The class gave us a fantastic overview of Thai cuisine, and Niti was a fabulously friendly, knowledgeable and fun teacher. I'm extremely happy to have discovered the secret ingredients of Thai cooking - I had always wondered what I was doing wrong! Classes cost 1000 baht for the full-day class, and 900 baht for the evening class. To get the 20% discount, don't use the online booking method. Message them here to say you're a My Chiang Mai Everything reader. 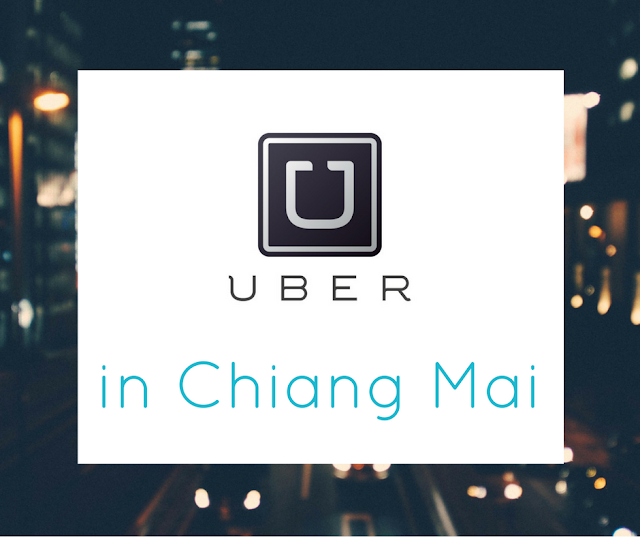 A driver will pick you up from your city-centre accommodation. You'll learn how to make eleven Thai-Akha dishes. Free-flow local Thai coffee is available for the entire class. Everyone eats together at the end of class. Great post! I also went to Thai Akha Cooking School when I was in Chiang Mai and really loved it. Oooooh snap! Bridget I adore your photography :) Thanks for reading my blog - I'm currently reading all about your Weekend at De Hoop Nature Reserve right now - that sky is amazing. Let's stay in touch! Are you still in Chiang Mai? Thanks Gale :) A Thai chef in THREE HOURS! That's impressive. Basil Cookery school looks great.